Where have I been? Reading. That's where. So it's been nearly forever since I last posted! I've was preoccupied by classes but am more than happy to report that I've passed those classes and am now being set free to enjoy summer! In the time since we last spoke I've read a few books. 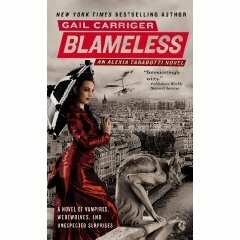 The first of which was 'Blameless' by Gail Carriger. It's the third in a five book series. Like the previous two it was a joyful read filled with strange action, steampunk adventure, and the kind of absurd mental images that will force you to laugh aloud no matter where you happen to be or who might be around. Of course, I would suggest starting with the first book, 'Soulless'. The second book I read was required for my swedish language course, entitled 'I taket lyser stjärnorna'. I gather that it's a roughly autobiographical retelling of the author, Johanna Thydell's, tragic youth, but honestly it was one of the worst books I've ever read. So bad, that I won't even be putting up cover art for it. I'm leaving open the possibility that I just don't appreciate teen angst in autobiographical form. The main character was incredibly unsympathetic and for the most part I just didn't understand what the author was trying to express with this book. I wanted her to make the right choices, wanted to know more about her mother, to understand better who this person was, but every page was riddled with disappointments and things left unsaid. In the end I wasn't impressed and won't be seeking out any more teen angst any time soon. The third book was also for my swedish class but for this one I was given a list and allowed to choose. 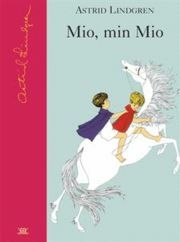 I picked Mio, min Mio by Astrid Lindgren- a dearly beloved swedish author that also wrote the Pipi Longstocking books. It was quite the classic children’s fairytale- before anyone cared about ratings anyway. It's dark and at times quite creepy. I'd also like to note that Ms. Astrid Lindgren was using invisible cloaks long before Harry Potter came about. When I first started reading this book it had a hint of a Harry Potter vibe to it, what with the little boy being an orphan who just knew deep down that his parents couldn't have been bad people and that someone somewhere wanted him, housed by peopled that didn't like him, in a life that didn't suit him, only to find out one day that he was meant for a world of magic and wonder. It was sweet and hopefully not the last Astrid Lindgren book I try- in Swedish of course. 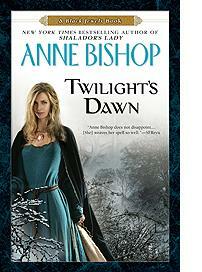 The last one, which I just finished yesterday, was Twilight's Dawn by Anne Bishop. Ignore the cover art on this next one! Sometimes I really hate cover art. Luckily Ms. Bishop's books are now published in hardcover versions as well, so I can buy those and take off the dustjacket with the picture. This one was the... ninth? book in her Dark Jewel's series which I began reading back when I was starting highschool, so it's been quite a while. I'm incredibly attached to the characters of this series, which isn't at all normal for me. I think I could be quite content if she would just continue writing books in this series for the rest of my life. It can move on to their children's lives or side characters or whatever she wants! I just hate the idea of not having another book from which to continue the life of this world she's created and sadly this last book left me feeling quite worried that Ms. Bishop intends to stop writing them. Hopefully I'm wrong... or rather, hopefully she just won't be able to stay away. I know I wouldn't be able to. Now that you say it, Harry potter really seem to be inspired by Mio min Mio. .. I had never thought about that (probably because it was so long since I read it XD). I really like the cover art on the Gail Carriger book. I can't even express how glad I am this semester is over so I can read again. The fact that you can now read Swedish (and my complete and utter jealousy of that fact) is inspiring me to learn a new language this summer. Maybe that's what I'll do with all the free time I feel as if I now have. Linn- Thank you! And like isn't quite the right word for how I feel about your food pictures... hungry would be closer. Katie- Which language? And you should see the cover art on the previous two books! I think you'd really enjoy that series. The main character is hilarious. Thanks for reading! Maybe I'll read some of them this summer. I feel like I'm floating in free time now that school's out. This is the first time in at least a month I've been able to do laundry. Even I was starting to run out of clean clothes. I'm thinking I'd like to learn some more German. I took it years ago and now I only remember bits and pieces. I also think it would be pretty beneficial for me to learn at least some Spanish. For music, though, it really behooves me to know a language other than Spanish.